Quick Search is a free local search tool to help users quickly locate files or folders instantly by key words. 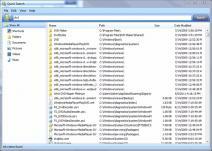 It is a much faster and easy-to-use alternative to Windows Search. Quick Search searches initially when you enter key letters and displays real-time searching results. Quick Search offers a search filter to limit search range and narrow down the search results for higher working efficiency with an intuitive interface. Quick Search is free and quick search tool to locate files and folders. ...... including a search box and real-time displaying panel for the files and folders found out in your local hard drive or sub-folders. On Quick Search's lighting quick interface, you will clearly see two major controls: the search box and real-time displaying panel. When you type any file name, subject or keywords into its search box, the results screen will display kinds of related files on those information, such as Name, Path, Size, Attributes and so on. What's more, Quick Search will display all documents inside the selected folders that contain these words - most of the time in less than a second. At the same time, it will list a number of similar files you do not need. Search the web with over 80 search engines straight from the system tray. Qweas is providing links to Quick Search 1.0.0.166 as a courtesy, and makes no representations regarding Quick Search or any other applications or any information related thereto. Any questions, complaints or claims regarding this application Quick Search 1.0.0.166 must be directed to the appropriate software vendor. You may click the publisher link of Quick Search on the top of this page to get more details about the vendor.